Since September 2018, delivery problems and delays in homologation due to the introduction of WLTP have hit the German automotive market. The consequences still remain visible in December with 237,000 new car registrations resulting in a drop of 6.7% for the German passenger car market. 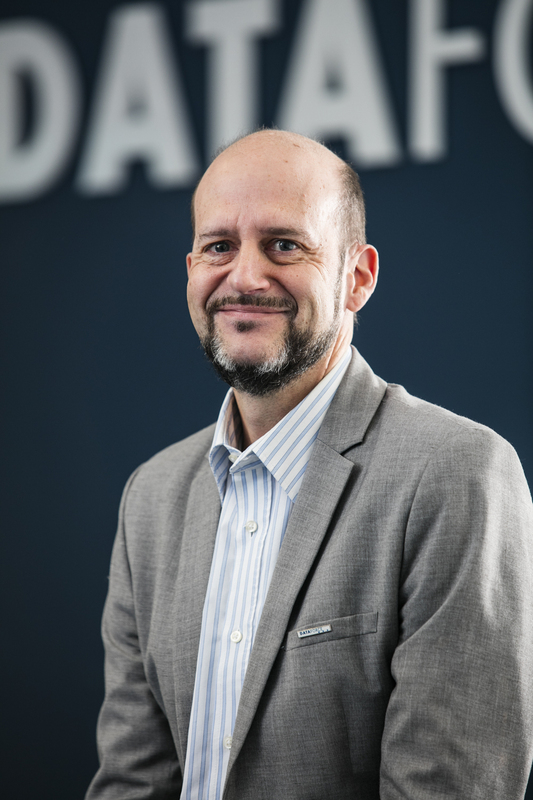 The biggest loss could be seen in private registrations with a decline of 12.8% over December 2018 while Special Channels’ volume fell by 2.9%. This was the outcome of a significant reduction of registrations specifically on both Dealerships and Manufacturer, thus overcompensating the rising amount (+ 14.7%) of car registrations on Rental companies. What about True Fleets? In the red for the fourth time in a row with – 3.5%, however this was at least a much smaller decline than seen in the previous three months. True Fleets’ loss of 3.2% for the full year 2018 is actually pretty close to the December figures, but the fleet industry shouldn’t be too disappointed as the reference for comparison (2017) was a record year. So, the fleet channel was far from underperforming and scored more than 800,000 units, only the third time this has been achieved since Dataforce records began. In addition, Germany was able to beat the UK for the first time since 2012 and to take the European fleet crown 2018! But, generous as I am, I can let our English readers know that there is a bit of solace for the United Kingdom, as it is still the biggest True Fleet market if you add light commercial vehicles. The top three brands (Volkswagen, BMW and Mercedes) all kept their positions and increased their volume, especially VW with a strong + 12.9%. For the brand from Wolfsburg the Polo was shining with an impressive + 128.9%, scoring its highest volume ever for the month of December and its biggest market share within the Small Car segment in almost five years (January 2014). Audi had to face another drop but managed to keep its fourth position ahead of Ford who had a very good last month of the year with + 18.0%. This pushed Skoda into sixth position, who were followed by Opel, Volvo, Renault and SEAT. 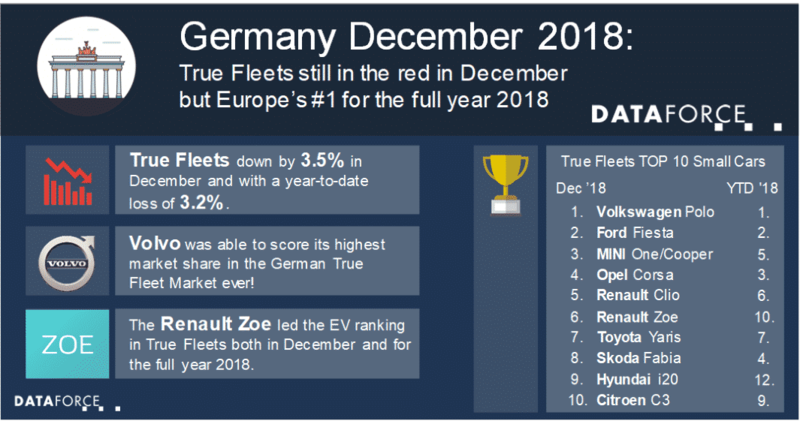 Looking closer into Volvo we saw a + 35.9% for the Swedish brand, not only achieving the highest growth rate in the top ten but also its best ever market share in the German True Fleet Market (3.2%). The new XC40, the XC60 and the Medium Station Wagon V60 all supported this outstanding performance. For the full year 2018 the loss for Diesel (- 12.4%) and the growth for Petrol (+ 12.6%) were almost equal in terms of percentage. That was different in December when Petrol was down by 9.7% and Diesel up by + 1.7%. December wasn’t a particularly successful month for the Alternative powertrains. Hybrids were down by 11.8% and the full electric vehicles even suffered by – 28.1%. But you must take into consideration that EVs reached a record share in December 2017. Nevertheless, some EVs performed really well. Renault’s Zoe increased its volume by + 50.6% and this helped the French car to secure the 1st place in the EV ranking with a lead of 130 units (full year) over BMW’s i3. Furthermore, the Zoe ranked sixth in the Small Car segment ahead of the competitors Toyota Yaris, Skoda Fabia, Hyundai i20 and Citroen C3 in December. Well done Renault!